Five bioengineering students at Rice University have developed an inexpensive, battery-powered neonatal monitor for babies that may save many lives in the developing world and the U.S. The Babalung Apnea Monitor was created as part of a year long senior capstone project, required of all Rice graduating engineering students. Team Breath Alert – Rachel Alexander, Rachel Gilbert, Jordan Schermerhorn, Bridget Ugoh and Andrea Ulrich first considered the problem; in developing countries, nearly half of the 12 million babies born prematurely experience episodes of apnea, or a sudden lack of breathing. Babalung works by trying to get the baby breathing on his own again, and if that doesn’t work, the device raises a red flag to inform health care professionals that there’s a problem. Keep reading to see how this creative and lifesaving device works. While designing their Babalung, the student team had to consider what wouldn’t work. For example, first the team considered an audio alarm but Gilbert noted, “There’s the risk that a nurse wouldn’t hear [the alarm] in a large room. And an alarm loud enough to hear might damage the baby’s hearing. So we went with a flashing bike light raised above the crib, so you can see it across a room.” The Babalung is strapped to a baby’s chest, and if the baby stops breathing, an elastic sensor contained inside the strap expands and contracts like a wave. 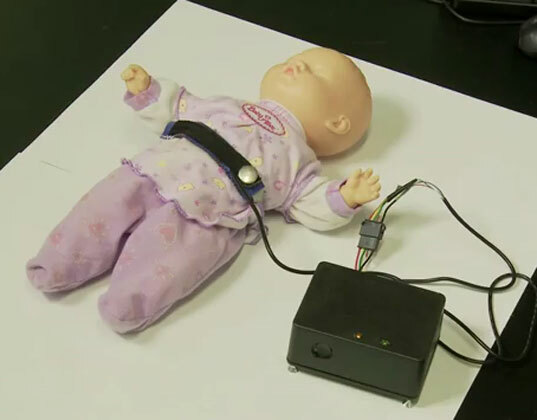 The machine self-monitors the waves and if the wave stops for 20 seconds, the attached microcontroller vibrates in order to try and prompt the baby to take a breath. After 5 seconds, if the baby still doesn’t breath, the visual alarm kicks in, thus alerting a nurse that there’s a problem. Students have also developed a smartphone app to receive data from the Babalung using Bluetooth. The innovative student team hopes to send three prototypes for testing in developing nations through Beyond Traditional Borders, part of the Rice 360? : Institute for Global Health Technologies, this summer. However, as you might imagine, the Babalung could be a lifesaver for babies and parents right here in the United States as well. Not only does Babalung have the potential to help prevent SIDS deaths, but it may also give worried parents peace of mind that most SIDS prevention products on the market don’t. Five bioengineering students at Rice University have developed an inexpensive, battery-powered neonatal monitor for babies that may save many lives in the developing world and the U.S. The Babalung Apnea Monitor was created as part of a year long senior capstone project, required of all Rice graduating engineering students. Team Breath Alert � Rachel Alexander, Rachel Gilbert, Jordan Schermerhorn, Bridget Ugoh and Andrea Ulrich first considered the problem; in developing countries, nearly half of the 12 million babies born prematurely experience episodes of apnea, or a sudden lack of breathing. Babalung works by trying to get the baby breathing on his own again, and if that doesn't work, the device raises a red flag to inform health care professionals that there's a problem. Keep reading to see how this creative and lifesaving device works.